Recent posts on ‘hell’ have prompted questioning among our readers. That was their purpose – not to stir up controversy for the sake of it but to encourage us all to examine our beliefs about this subject and where those beliefs have come from. We have looked at the occasions on which the actual word appears in English translations of the Bible, and then in the last post I shared with you the series of encounters with God which led me down this route in the first place. But we promised that before we move on we would also examine the passages where the word itself does not appear, but ‘the Bible clearly says’ that some people go to a place of eternal torture when they die. Look at what happened leading up to Stephen being martyred in Acts 7:54: his accusers (members of the Sanhedrin) became furious and gnashed their teeth at him. Weeping and gnashing of teeth was an expression not of tormented pain and anguish, but of rage. When the chief priests and the Pharisees heard His parables, they understood that He was speaking about them (Matt 21:45). The only reason they did not seize Jesus then and there was because they were afraid of the public outcry. It was not the general mass of humanity that Jesus was speaking of when He talked about gnashing of teeth and the outer darkness in Matt 8:12, 13:42, 13:50, 22:13, 24:51, 25:30 and Luke 13:28. It was this group of self-righteous individuals who would find themselves outside the covenant they were so sure was their birthright. In that ‘outer darkness’, having failed to heed Jesus’ warnings, they would respond with defiant anger. Then they will go away to eternal punishment, but the righteous to eternal life (Matt 25:46). To be fair, you can understand why people tell us ‘the Bible clearly says…’. Our English Bibles certainly seem to. But we need to look at the Greek words used by the original writers of the New Testament books. Firstly, what do we understand by ‘punishment’? Kolasis is the word used here, and it means ‘correction’, not ‘retribution’. Greek had a word for retributive punishment, timoria, which is never used of God in the New Testament. God’s discipline is always restorative. Secondly, the Greek language had no word for ‘eternal’. They could have invented one if they had wished to: the language was exceptionally well-suited to building new words from component parts. They did not need the word because they did not have the concept. The root of the word used here, aionios, is ‘age’. For Greek speakers, an aion could mean a lifetime, a generation, or a longer period of time – but always of finite length. So not never-ending, not forever and ever, not eternal. That depends on what aspect of the life we focus on when we read ‘eternal’. Surely it is not primarily the length, but the quality. The life being promised is the-God-kind-of-life: and the punishment therefore is the-God-kind-of-punishment: restorative and corrective, not retributive. There are other reasons to treat this passage with caution, too. The sheep and goats in the parable are nations, not individuals. The criterion for escaping ‘eternal punishment’ is good works, not faith in Jesus. So if you are prepared to assert that whole nations will be sent to heaven or hell – based on their works, not on faith – then you can reasonably use this passage to argue your case for an ‘eternal hell’. So far I have not come across anyone in any theological stream who is prepared to do so. The more I consider this phrase, the more I am inclined to Chuck Crisco’s view that it refers to ‘the accuser and his messengers’, which is a perfectly valid translation of the Greek words used. The Law, the religious system and those who fought to preserve it were heading for the fires of the Temple Mount and Gehenna at the end of the Old Covenant age (aion) in the destruction of Jerusalem by the armies of Rome (AD70). But if that is a step too far for some, let’s consider the purpose of fire. The Greek word is pur, from which we get words like ‘pure’ and ‘purify’. Jesus came baptising with the Holy Spirit and with fire and Paul said that everyone’s work will be tested with fire. I believe we will all go through the fires of purification to restore us to our original design and identity as sons by removing anything that distorts that image. We can engage with that fire now, or wait until we die (I advise option 1). There is a fire which awaits everyone who has not gone through it already but it is for purifying and correcting, not for destroying. It is the consuming fire of God’s passionate love. And my testimony is that even those who did not accept Jesus while alive will still get to choose when they experience that fire after death. So what was Jesus’ point in this story of sheep and goats? ‘Brothers’ was a term used by Jews to refer exclusively to other Jews. Again (as throughout these chapters of Matthew’s gospel) I would suggest that in His love He was setting out a warning to the religious-yet-unbelieving Jews, especially the leaders, who instead of serving ‘the least of these my brothers’ (the believing Jews) would imprison and kill them instead. We touched on this before, and for an in-depth look into this parable we recommend Brad Jersak’s analysis in Hell in a Handbasket. The context of Luke 16 is all about wealth and true riches. In the verses immediately preceding this parable Luke tells us that the Pharisees were lovers of money. Jesus is not offering a treatise on the afterlife, but a warning about putting your trust in riches and failing to help the poor. Jesus quite literally means that the rich and poor of that age will see a reversal of fortunes in the next. Losing your soul for temporal gain is the cost of materialism and the results of living a DIY self-righteous life (Matt 16:26). Abraham’s bosom is not a biblical phrase but a mythological or cultural one found in the Babylonian Talmud. Jesus is using a culturally accepted idea as the background for his story. Aspects of the story make a crass literalism awkward: how does the rich man communicate with Abraham across the chasm? Does everyone there have a direct line to the patriarch? Does someone being incinerated in a furnace care about thirst? Are these literal flames? And since hades precedes the resurrection of the body, do we have literal tongues with which to feel thirst? Is this also the literal Abraham? Do the millions in his care take turns snuggling with him? Or is his bosom big enough to contain us all at once? How big he must be! And so on into implausibility. Taking the parable seriously means we mustn’t take it so literally. (Brad Jerzak – Why The Lake of Fire, Tormented Lazarus & Gnashing Teeth Can’t Conjure Up Eternal Torture). Do we think that when we are in heaven we will be able to see our loved ones in ‘hell’, talk to them but offer them no hope, yet be happy with that? … when the Lord Jesus will be revealed from heaven with His mighty angels in flaming fire, dealing out retribution to those who do not know God and to those who do not obey the gospel of our Lord Jesus. These will pay the penalty of eternal destruction, away from the presence of the Lord and from the glory of His power (2 Thess 1:7b-9). If you believe in hell as eternal conscious torment, the word ‘destruction’ does not work for you. If you believe in the annihilation of the wicked, the combination of ‘eternal’ and ‘destruction’ makes no sense. However you look at it, we need to delve deeper. The words in bold are all poor translations: diké (translated penalty) means justice, judicial hearing, legal decision; the related word ekdikesis (translated retribution) means that which arises out of justice; aionion (eternal) we know means pertaining to the age; olethros (destruction) means the state of being lost, lostness; apo (translated away from and from) does indeed mean from, but in the sense of coming out of or coming from and not separated from. Matthew DiStefano points out that the phrase Eternal destruction from the presence of the Lord (olethron aionion apo prosopou tou Kyriou) in 2 Thessalonians 1:9 mirrors exactly that in Acts 3:19: Times of refreshing from the presence of the Lord (kairoi anapsyxeos apo prosopou tou Kyriou). No one translates that ‘times of refreshing away from the presence of the Lord’. So Paul was encouraging the Thessalonians that there was a judicial decision about to come from the Presence of the Lord which would have a consequence for those who were persecuting them: it would involve a state of lostness pertaining to the age. Or you can read it as God’s consuming-fire-presence delivering a justice that totally ruins their lostness. This is not about some future end of the world event or afterlife experience but what Jesus prophesied would occur in that generation (and did occur in AD70) – but even then, God’s justice is always restorative for everyone. Four verses mention the lake of fire in the Bible, all in Revelation 19 and 20. Revelation is an apocalyptic book, symbolic and cryptic in nature, the only one of its kind in the New Testament but very common in Jewish and Greek literature. Only those ‘in the know’ and immersed in the culture in which it is written will fully understand the symbolism. Symbols can represent multiple concepts. One thing is certain: apocalyptic literature is never intended to be read literally. We can get clues about some of the symbols because they also appear in the book of Daniel, including the beast being cast into the blazing fire (Dan 7:11). Just as Daniel’s beasts were figurative, representing various nations, so too is the lake of burning sulphur figurative. The book of Revelation is not a prophecy for the far distant future but was an immediate warning to first-century Israel that just as Sodom and Gomorrah fell in fiery destruction, so too the Jewish religious system was in danger of ending in the same manner. The ‘book of life‘ mentioned is a commonly understood concept in the Jewish tradition and refers back to the law where according to the Talmud this book is opened every Jewish new year on Rosh Hashanah. In Revelation 20:14, we see Death and Hades thrown into the lake of fire. Here the lake of fire may well represent God’s (completed) triumph over evil, sin, the grave and death through the power of the cross. Many of the early church Fathers saw the lake of fire as a spiritual place where everyone in humanity was purged of their unbelief and sins so that they could eventually believe in God. I believe it is fed by the river of fire which flows from God’s throne. And the devil who deceived them was thrown into the lake of fire and brimstone, where the beast and the false prophet are also; and they will be tormented day and night forever and ever (Rev 20:10). Forever and ever is a poor translation of to the ages of ages. Brimstone (Greek: theios, closely related to the word for ‘God’) was regarded as having power to heal and purify. Basanizo (translated torment) is ‘testing with a touchstone’ (in other scriptures it is translated as tossed or battered by waves, straining at the oars of a boat, and being in labour while giving birth). Enough! No matter how many objections we address, how many scriptures we dig into, we know that some will not be persuaded. These posts are really not intended for them but for those who discover that God is already on their case – and even they will probably come up with other verses or passages not included in this brief survey. There are far more comprehensive treatments of the subject elsewhere; we have referenced some of them in the text and below. But ultimately all of us are going to need to go to God, in whatever way we know how, and hear what He has to say to us about the questions we have. We can all experience the fire and passion of God’s love today for ourselves. Let’s not hide from it or try to avoid it. and the purification that My consuming fiery love brings. to reveal hearts, minds and motives. So I call for the purification of fire. I call for the fire of love to penetrate the hardest, darkest areas of our hearts. I call for the refiner’s fire to burn away the dross of self. I call for the light to shine, to expose the things hidden because of shame. I call for love’s overcoming power to reveal and break every chain tethering God’s people to the DIY path. I call for the passion of God’s heart to be revealed in His wrath directed towards all brokenness and lost identity. Let the consuming fire of God’s love burn in our hearts and minds to restore us to true sonship. *Freedom Apostolic Ministries receives a small commission for sales of the book through this link. In the last two posts I have quickly outlined what the Bible really says about ‘hell’. That has caused a certain amount of controversy (to put it mildly). But I am not trying to invent a new theology or doctrine, or even ask you to believe what I believe, and this time I am simply going to share my testimony with you. In recent years, God has given me experiences that demonstrate the strength of His love, profoundly challenging my beliefs and what I used to think the Bible was saying. This all happened as part of the removal of the manmade constructs of my mind, and it was not an easy process for me as those mindsets, doctrines and theological frameworks of my thinking were very strong. For 3 weeks I felt severe pressure around my mind, almost like a physical pain. God was challenging me to reconsider the issue of ‘hell’ but my long-held belief systems discouraged me from doing so. You see, I had even been to the fire. I had had visions of people in anguish in what I called ‘hell’. So I purposely held back, even though frequent love-encounters were making it increasingly difficult to deny what I now believe. That is, until Jesus actually took me back to the fire to see. Wisdom’s heights was my entrance. Does not wisdom call, and understanding lift up her voice? On top of the heights beside the way, where the paths meet, she takes her stand; beside the gates, at the opening to the city, at the entrance of the doors, she cries out (Prov 8:1-3). Now Jesus took me back there. He showed me the heritage area and I looked at the family line of my father’s father. Then He showed me a door I had not seen when I came before. He explained that the door had been there all along, but my framework of beliefs would not allow me to see it. Then He gave me a silver heralding trumpet and we went through the door into the fire. There were thousands of people there from that part of my family line, not talking to one another; isolated individuals who appeared to be in anguish of soul. They were not being tormented; there was no devil there with a pitchfork or anything like that. They were there, on their own, in a place of consuming fire. So I looked to Jesus, hoping He was going to do something. He just stood there looking right back at me. So eventually I preached the good news to them, though not very well! I felt rather tongue-tied and overwhelmed. Overwhelmed with love, actually, and of course completely unprepared. But at least I told them that they could accept Jesus and come out. I figured Jesus must have given me the trumpet for a reason, so I blew it. He turned to walk out, and there was no way I was going to stay in there on my own, so I followed Him back through the tunnel of fire. I went through the door back to Wisdom’s heights and this time I saw that the door was like a fiery sword (I knew that a fiery sword guards the way to the Tree of Life). I looked back and a few hundred people had followed us to the door. As they approached I saw them kneel, I heard them confess Jesus as Lord and they walked out and through the gates into Zion. Jesus said “Just tell people that you are doing what I did – and I told you to do what I did, and greater things. This is just the beginning”. So I present myself as a living sacrifice on the altar in the temple every day. Since that first time, I have been back to engage each of my 4 generational family lines and preached the good news to them. When I was in China in 2017 someone gave me a silver heralding trumpet just like the one Jesus had given me. One morning while I was there I woke at 3am and felt a strong desire to engage the altar and ask for the fiery coals to touch a specific area of behaviour, the area of divorce. As I did, I began to feel intensely loving towards everyone in my generations who had been divorced, not angry or resentful, and I began forgiving them and blessing them. Once I finished I went to the fiery place again. I preached to all my generational lines with boldness, blew the silver trumpet and this time many more responded. They followed me out, came to the door, confessed Jesus as Lord and went through. Later, on a Sunday morning here at Freedom as I was embracing the fire another area surfaced. I again went back and preached with renewed boldness and once again many more responded. Another time, I wondered what it might be like if I took communion down into the fire. So I went back there and offered communion, the body and blood of Jesus, to those who were in the fire. Yet again, many responded! More recently I became aware that there were many in that place with fractured souls, what we sometimes call ‘stuck parts’, mostly caused by trauma in their lives. They were double-minded, triple-minded or worse and were unable to make a decision to follow Jesus. So I asked Jesus to come with me and I told them they could come to the Prince of Peace (shalom means ‘wholeness’) and be made whole. Vast numbers of them did so. My strong desire is to empty that place, but for that to happen I need to embrace the fire myself. I need to be good news and demonstrate that good news in my own life. I have now had many experiences of going into the place of fire both for personal refining and on rescue missions. The fire of God is for purifying and refining and removing all the dross in people’s lives. They are waiting for someone to come and share the good news with them. One day, before I even mentioned this publicly, a friend I meet with online said he had something to share with me. He had been engaging in heaven when some of his family members came up to him. He was surprised and said “I didn’t know you were believers in Jesus!” And they said, “We weren’t. But we remembered that you said your whole household would be saved, and Jesus came and preached the good news to us, and that’s why we are here.” This really did not fit my friend’s theological box, as he put it. He was encouraged when I then shared my experiences too. Since then (and especially after this topic cropped up in several of my regular online mentoring groups) I have had conversations with others and I have heard many testimonies of people who have gone into the fire and preached the good news as Jesus did. After I shared this in the Vision Destiny 2017 series I had a number of emails from people thanking me for opening up the discussion as they had been afraid of sharing their experiences because of the reaction they knew it would cause (a reaction I have experienced for myself). This view of the fire as purification and a place from which people could be rescued is not some strange new doctrine. This was the position of many of the early Church Fathers and others across the church spectrum through the last 2000 years: Clement of Alexandria, St. Macrina, St Gregory Nyssen, St Isaac of Nineveh (and many other Fathers), and moderns including Fr. Sergei Bulgakov, St. Silouan the Athonite, Fr. Alexandre Turincev, Metropolitans Kallistos Ware and Hilarion Alfeyev. immediately narrow your options to the views espoused by those who carry that label. are assumed by others to believe everything they think that an [insert label here] believes. Some will say “If people are going to be saved anyway, then what is the point of preaching the gospel?” Is that not a rather selfish view? Do we not want people to know and enjoy relationship with God now? Or to find and fulfil their destiny in this life? And I certainly do not want anyone to go into the consuming fire of God’s presence without knowing Him. It is not a pleasant place to be if you don’t know Him. If anything, I find I want to preach the good news more than ever. They will also say, “Well, if there are no consequences to my behaviour then I might as well just keep on sinning.” If that is true, then they are only behaving as they do out of fear. They are living under the law, not grace (whilst they sadly shake their heads and accuse us of promoting ‘another gospel’). Why on earth would we want to keep on sinning, when sin messes up our relationship with God and everything else in our lives and its wages are death? It is best not to argue with people. We can share our testimony, and just love them whether they agree with us or not. We are not looking to provoke controversy, enter into fruitless disputes or draw people into making accusations. These posts are not intended for those who only want to fight their corner and prove that they are right. They are for those who are open to lay down their own presumptions and assumptions, to engage with God for themselves and allow Him to reveal the truth about His love for them and for all His creation; for those who will embrace that truth and be part of the ‘restoration of all things’ (Acts 3:21). Jesus told me to release this message and encourage the Joshua Generation to arise and be bold, to come to Him and He will open the gates to reveal the consuming fire and show them the way just as He has shown me. I believe we all have the ability to engage the fiery place and do what Jesus did, to preach the good news to those spheres that we are mandated to engage. The refining fire of the altar is where the authority to preach will be given. As we embrace the fire with urgent desire, great authority will be released to us. I believe we get to choose when we go to the place of fire. We can go now, or later, but God is a consuming fire and we cannot escape His love. That love is an unquenchable fire, intended to refine and purify us. Let’s choose to embrace the fire now. “Three views of hell: burn forever, annihilation, restoration… How did you come to yours?” – Mike answers George’s question here on YouTube: Supernatural Mentoring Monday 12th March 2018 Washington or scroll down to view the video in full on this page. Hell (or not) – YouTube playlist of Mike’s Supernatural Mentoring sessions which include references to this subject. 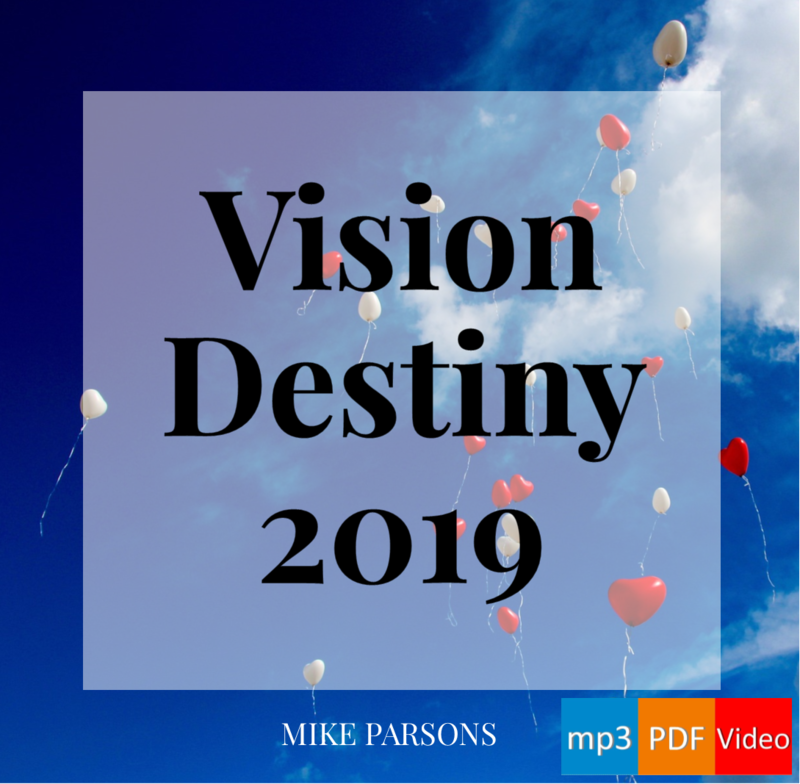 Vision Destiny 2017 – free teaching series by Mike Parsons. (Vision Destiny 2018 is also available). The Heresy Hunters of ‘Come Sunday’ – Matthew Distefano’s ‘All Set Free’ blog (and if you have Netflix you might like to check out the ‘Come Sunday’ movie about Bishop Carlton Pearson to which this article refers). As I have chronicled in these posts, God has personally started to walk me through encounters that continually challenge my perception of who He is. I am on a journey of discovering the true nature of God as love and as a result I find myself questioning and often rejecting the established doctrines and theological positions of the modern-day evangelical church. God has shown me that I (and the church, and the world) have been badly deceived by ‘do-it-yourself’ religion. Nowhere does this deception show up more clearly than in our approach to evangelism. God was in Christ reconciling the world to Himself, not counting their trespasses against them (2 Cor 5:19). This is the message of reconciliation at the heart of the gospel we are called to preach. And the word translated ‘world’ is actually the Greek word ‘kosmos‘, which is even wider than we might have thought. Yet when I looked closely at how we have done evangelism, even here at Freedom, I uncovered a fear-based system which originates from a wrong perception of God as angry, vindictive and cruel. Religion has hijacked the gospel, made ‘escaping hell’ its focus and used the threat of eternal damnation to scare people into the kingdom. “Good news! (But first, the bad news…)”. My own conversion experience was like that. I heard sermons about hell and judgment week after week and decided I needed ‘fire insurance’. For most Christians, hell is a given, an unquestioned doctrine. Hell fits their doctrinal system. God is love but He is also just. He must punish sin. Hell is the punishment for sin. Simple. I knew it would take a while to address this issue properly, and I resisted broaching the question of ‘hell’ for some time, as if it were some kind of ‘no-go’ area, but God would not let me be. It just kept resurfacing, both in my encounters and as I prepared the ‘new versus old’ teaching module in the Engaging God programme. It is a concept that is generally accepted in most (if not all) religions and in wider society, but I knew deep down that something in what I had been taught was not consistent with the Father’s love. Namely, that God was in Christ reconciling the world to Himself, not counting their trespasses against them (2 Cor 5:19). The whole cosmos has already been reconciled and no-one’s trespasses are counted against them. So from God’s perspective what need is there for a ‘hell’? sinners, Christ died for us (Rom 5:8). Who is the us that Christ died for, a select few or everyone? For the love of Christ controls us, having concluded this, that one died for all… (2 Cor 5:14). For if while we were enemies we were reconciled to God through the death of His Son, much more, having been reconciled, we shall be saved by His life (Rom 5:10). God is not angry, even with those who may feel like His enemies. When you were dead in your transgressions and the uncircumcision of your flesh, He made you alive together with Him, having forgiven us all our transgressions, having cancelled out the certificate of debt consisting of decrees against us, which was hostile to us; and He has taken it out of the way, having nailed it to the cross (Col 2:13-14). For Christ also died for sins once for all, the just for the unjust, so that He might bring us to God… (1 Peter 3:18). Pitying and merciful is the Lord; lenient and full of mercy. Not unto the end shall He be provoked to anger, nor into the eon (age) will He cherish wrath. Not according to our lawless deeds did He deal with us; nor according to our sins did He recompense to us (Psa 103:8-10, Septuagint). “I will heal their apostasy (unbelief), I will love them freely, for My anger has turned away from them” (Hosea 14:4). “Put me like a seal over your heart, like a seal on your arm. For love is as strong as death, jealousy is as severe as Sheol; its flashes are flashes of fire, the very flame of the Lord. Many waters cannot quench love, nor will rivers overflow it” (Song of Solomon 8:6-7). Rather than meaning torment and punishment, in this passage fire is a depiction of passion and unrelenting love: God’s love is a flame that can never be quenched or extinguished and He is unrelenting in pursuing us for relationship. There is no fear in love; but perfect love casts out fear, because fear involves punishment, and the one who fears is not perfected in love (1 John 4:18). How can God punish people if He is love? The two are incompatible. He cannot and He does not. God’s justice is always restorative. The idea of ‘hell’ as a place of perpetual torment is so prevalent in the world’s religions and cultures that if you mention ‘hell’, most people have a pretty clear image of what you are talking about: it probably includes fire, demons with pitchforks and people in torment. This image has been propagated by literature through the ages and more recently by films and TV shows but it was not the view of the early church. The writings of the Old Testament and Jewish literature throw up various different views of the afterlife, including annihilation or sleep until judgment, but eternal torment after death was not a Hebrew concept at all. The Interpreter’s Dictionary of the Bible comments, “Nowhere in the Old Testament is the abode of the dead regarded as a place of punishment or torment. The concept of an infernal ‘hell’ developed in Israel only during the Hellenistic [Greek] period” (i.e. beginning in the fourth century B.C.). There are even some people today who teach that at the resurrection, God will give unbelievers new bodies specifically designed to withstand eternal torture. What kind of a god is that? Is that really the God who was perfectly revealed in Jesus? By now, you may be thinking of passages of scripture, even of Jesus’ own teaching, which seem to contradict what I am saying. What about the sheep and the goats, or the rich man and Lazarus, or the outer darkness where their worm does not die and their fire is not quenched and there is weeping and gnashing of teeth? I promise we will look closely at each of those passages (and others) in coming posts. Jesus never warned anyone about ‘hell’, nor did Paul or any of the other New Testament writers, nor did God tell Adam that he and his descendants would go to ‘hell’ as a result of the fall. There is no word for ‘hell’ in the Greek or Hebrew language. It is not a biblical concept at all. Gehenna (Greek) name of a valley outside Jerusalem used as a fiery rubbish dump. In English, the word ‘hell’ comes from Proto-Germanic ‘haljo’, whose root ‘halija’ means ‘a concealed or covered place’. The Norse god Hel is Loki’s daughter, and in that mythology she rules over the evil dead. The religious institution and its supporters will insist that if you question the doctrine of ‘hell’, you are rejecting what has always been agreed upon by the Church. It is not so. Orthodoxy is a myth, and it is high time to rethink this subject. Because if God is love, if God is good, if God is not angry, if God does not require appeasement or sacrifice, if God does not punish us then what is the purpose of ‘hell’? Does ‘hell’ as we know it even exist? We will look at this again. Note: In these posts I can help you clear away some of your false preconceptions and assumptions (if you are willing) but I am not going to attempt to convince you to see things the way I do; if you really want to know where people go after they die, you will need to ask God to show you. Author Freedom ARCPosted on Wednesday 14 February 2018 Thursday 31 January 2019 Categories New For OldTags bible, choices, False doctrine, heavenly encounters, Joshua Generation, love9 Comments on 242. Enjoy The Ride!